One of the ever popular Preserve Pots from Carlton Ware. 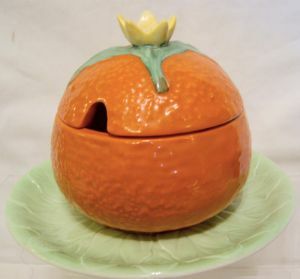 This is a Large Jaffa Orange Preserve Pot - shaped, not unreasonably, as a textured orange with a yellow flower finial set on several green leaves. This item is particularly hard to find as not only is the Cover in perfect condition, it comes complete with the Stand to match. This latter item is often lost or broken so this one is a welcome change. Interestingly, I have also a smaller version in identical condition available currently. The Stand has a diameter of 6.25 inches (15.5 cms) and has a medium green ground. The Jaffa Pot is 4.5 inches (11.5 cms) tall. It is in excellent condition throughout with no crazing. It has the curved Carlton Ware backstamp on both pieces and is shape 331, introduced around 1926.